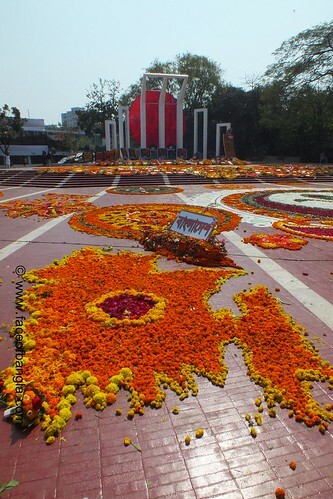 Thousands paid their tribute to the language Martyrs by putting flowers on the foot of "Shaheed Minar" (National Monument of Language Martyrs) in Bangladesh. Also, some volunteers decorated the stand with symbolic map of Bangladesh by colorful flowers on this day of 21st February, 2014. It is to mention that, The day of 21st February is the International Mother Language day. At this very day of 1952, dozens of students & political activists were killed when the Pakistani police force opened fire on Bengali protesters who were demanding equal status for their native tongue, Bengali.